This is the official Jupiter adjustable thumbrest. 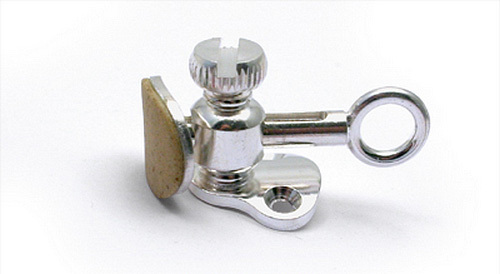 It is suitable for use on many clarinet models, wooden or plastic, not just the Jupiter brand. We find it to be stronger than many other brands thumbrest additions and it's our main recommendation for a replacement thumbrest for clarinet. *Please note the item is supplied without the screws needed to attach to the body. These are sold separately (as many people have the relevant screws already). Our catalogue code for the screws is WKJ1066. No screws supplied. Using the screws I have I cannot tighten the rest to the clarinet, so I either have to return it, scrap it, or pay to have it professionally fitted. The supplier responded:Thanks for your recent purchase of the thumbrest. The item is supplied to us without screws and we do show in the image on the site that no screws are supplied. We could/should/will however write a clear description to compliment the image that will help avoid any confusion if the image is not clear enough. We do keep the screws in stock and they are the next product along on the website listing. I will email you a direct link to the screws and this should resolve your issue.